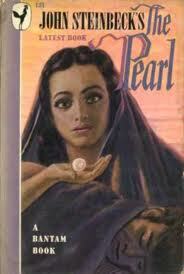 The Pearl by John Steinbeck research papers discuss the many critical themes in Steinbeck's novel. As one of the most important novellas of the 20th century, The Pearl by John Steinbeck possesses a number of critical themes. First is the role that greed plays in destroying the lives of individuals. When Kino discovered the pearl, he intended on using it to pay for his son’s medical treatment, a selfless act. However, the people of the town were greedy, and engaged in varying levels of violence and destruction to secure the pearl for themselves. When Kino’s domestic partner realizes this, she herself tries to get rid of the pearl, with Kino’s greed for possessing it causing him to be violent towards her. Further, Kino was greedy when considering the amount of money he could obtain for the pearl; he believed that the offer he received in the town was not sufficient, so he intended on going to the capital. Had he not been greedy and had he accepted the original offer, his son would not have been killed by the tracker’s bullet. Steinbeck was also incorporating a theme that was common in his own society: imperialism and racial superiority. Because the white man that provided the medical care for the village would not treat Coyotito without first receiving an extensive sum of money, Kino was forced to travel to the capital to have enough money to pay for his services. The white man felt he was superior to the native people; he felt he could charge them whatever he wanted, whether or not going without the treatment would be fatal. The doctor symbolizes the arrogance of colonial nations throughout the world in the mid-20th century, many of whom reacted the same way to the native peoples they were oppressing. Though only a minor character, the doctor’s actions shaped the course of the novella, allowing his importance to the theme of the story to become apparent upon further analysis. Imperialism - Imperialism research papers point to the Victorian Era, Karl Marx and even Dostoevsky as sources of imperialism and fostering imperialistic thinking. Themes in a Farewell to Arms - Themes in A Farewell to Arms research papers look at many aspects of the novel, such as main character Frederic Henry. Ma Joad - Ma Joad, from John Steinbeck's The Grapes of Wrath, is a strong main character in the classic American novel. Of Mice and Men - Of Mice and Men Research Papers delve into a book by John Steinbeck about two migrant farm workers. Symbolism in Of Mice and Men - Symbolism in Grapes of Wrath - John Steinbeck included numerous symbols in The Grapes of Wrath. Tortilla Curtain - Tortilla Curtain Research Papers delve into a story about two different families one of illegal immigrants, and one of a wealthy family. Theme of Grapes of Wrath - Theme of Grapes of Wrath research papers on John Steinbeck novels. Beloved Characters - Beloved Characters research papers discuss the existence of beloved characters that have emerged from childhood books and adult literature. Bananas, Beaches, and Bases - Chrysanthemums Research Papers on John Steinbeck's Short Story. Age of Innocence - An Age of Innocence Analysis must pay heed to the novel’s predominant theme of the personal struggle between individuality and conforming to social expectations. Feminism - Feminism research papers overview women's rights and the feminist movement. Order a research paper on feminism from Paper Masters. Symbolism in One Hundred Years of Solitude - Symbolism in Grapes of Wrath – John Steinbeck included numerous symbols in The Grapes of Wrath. Book Censorship - Book Censorship essays examine the occurrence of banning books in the United States. American Dream in Literature - The Great Depression helped foster the sense that the American Dream was dead, represented in The Grapes of Wrath or Of Mice and Men by John Steinbeck. Literary Style - Literary Style essays examine the way in which an author uses the various elements of character, plot, theme, and setting in order to tell his or her story. Analyzing a Short Story - Analyzing a Short Story is easy with help from Paper Masters' specific guidelines, including an outline that shows you how to analyze a short story. American Dream and Gatsby - American Dream and Gatsby research papers account the classic novel The Great Gatsby by Fitzgerald. Paper Masters writes custom research papers on The Pearl by John Steinbeck Theme and discusses the many critical themes in Steinbeck's novel.